Carsten will be one of the contributors/speakers at the 2014 International Railway Safety Council in Berlin next month. 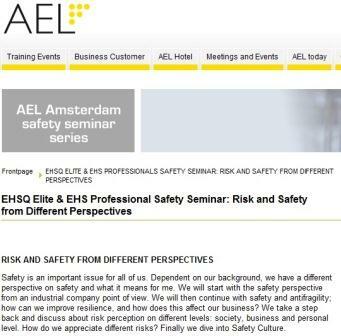 We've previously advertised the Safety Symposium that will take place in Amsterdam in November of this year. It has a fantastic program with great keynote speakers and presentations by safety professionals from all over the world. The event has recently been moved to a larger venue because of the very good response. Please click on the picture to check out the program and find the details for participation. This promises to be one of the top HSEQ events of 2014 - make sure you're there! There appears to be a lot of confusion about indicators and how to use them for steering. Just a simple illustration of how processes work. You put something in them (input), you do something with them (throughput) and you get a result (output). And so you have randomness, noise and external factors that may affect your result (ending in something we will call outcome). You can largely control output, outcome not so much. Make sure your performance isn't measured against outcome parameters, rather use one of the other three. That doesn't mean that you shouldn't monitor outcome parameters at all, but regard them as an indicator and initiation of further investigation, nothing more.